An opening flashback shows Lex Luthor trapped at the bottom of a well. He asks his father for help, but is refused, being told that only the weak ask for help. 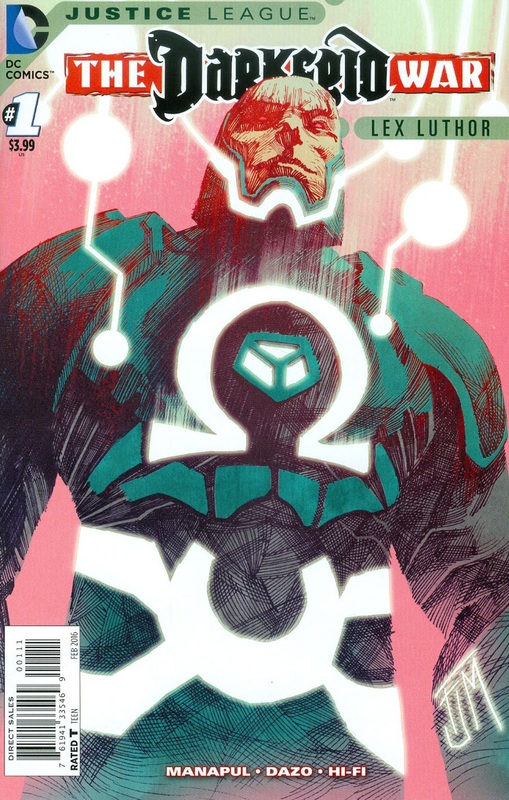 The scene returns to the present, where an Omega powered Luthor, along with Ardora, a denizen of Apokolips are placed in a precarious situation due to an outburst on Lex's part. Luthor's anger and unwillingness to accept aid, due to the lesson taught by his father, block his potential with the Omega force. However, Ardora convinces Luthor to accept her assistance, and in doing so, Luthor fully inherits the Omega Effect, and a horde of paradaemons as well. Story - 3: There have been dozens of stories attempting to explain Lex Luthor's character; short scenes or whole series that attacked the question head-on, but with the exception of one, none of them truly explain why Luthor is the man we know him to be. This one-shot is to be added to the pile that tried and did not succeed in anything new, as it was nothing new. There are some characters that truly do not benefit from back-story or the revelation of their motivations. Some characters just "are". The idea that every player has a luxurious and rich origin that is just waiting to be unearthed, particularly if it hasn't been after six decades, is a faulty notion at best. Lex Luthor is the world's smartest man. He's ruthless, whether mad scientist, or corrupt businessman. He's evil, in that his twisted hatred of Superman, promulgates an almost implacable desire to see him destroyed, at any cost. That's more than enough to work with, and it has worked for longer than most readers have been reading about Luthor. However, the nagging question of "why" will poke its head into the mix, as there really isn't any reason behind Luthor's enmity of Superman that holds matter. The best attempt was a Silver Age tale, Adventure Comics #271, and that was misconstrued by readers to no small end. Luthor tends to work best in the middle of things, much like his chosen nemesis. Art - 3: The splash of Luthor and his newly acquired team of Paradaemons is the bright spot, in an otherwise sturdy and plain effort. Cover Art - 2: Such a flaccid cover. How would a reader know it's Lex, without the name on the cover?